Paul McCartney Signed Left-Handed Hofner Bass. In 1956, Walter Hofner conceived an amplified semi-acoustic bass that revolutionized popular music. The design was launched at the 1956 Frankfurt Music Fair and rose to fame after Paul McCartney bought his first Hofner bass in a shop in Hamburg in 1961, and used it on many of the Beatles' most famous songs. McCartney continues to use Hofner to this day, and the design is often referred to as the "Beatle bass." This Hofner Icon Series bass guitar (made in China with slightly different materials, and lacking the "zero" fret) has a design approximating Hofner's original, and is beautifully signed across the pickguard by McCartney in blue felt tip. In Excellent condition, accompanied by a hard-shell carrying case. 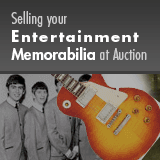 Accompanied by letters of authenticity from Beatles autograph experts Frank Caiazzo and Perry Cox.